In the last few days we have seen this Government embark upon a renewed initiative to slash the cost of the public sector (well, at least in certain areas). Of course there has been plenty of commentary from political pundits and academics regarding the challenge laid out by George Osborne, but I think there are several critical leadership perspectives that need to be drawn out. Firstly, the strategy is vague and too open to interpretation. We acknowledge that integration of services at a local level will be needed and that citizens will in many instances have to take a more proactive role in managing both their own needs and the needs of others in their families and their communities. But in government the governance is siloed. Asking departments to produce re-imagined delivery vehicles to deliver 40% cost reductions that cut across departmental boundaries is flawed; turkeys and Christmas spring to mind. If we were to assume that Mr Osborne will not get what he needs from government departments, then either the Treasury has worked it all out (in which case here comes a load of centralist control) or he places the burden locally. This leads me to my second Leadership point: Now is the time for the configuration of local public services to be configured at a local level, and more than ever this needs to be done in health and social care. We need a properly built case at a local level to be presented that provides new options for ministers to save money and deliver improved outcomes for the people of this country. We will not achieve the innovative thinking required within the constraints of the current structural and governance arrangements in place. 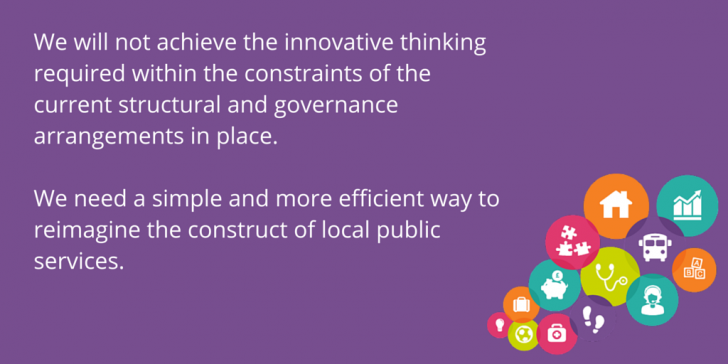 We need a simple and more efficient way to re-imagine the construct of local public services. And this is the real leadership challenge for Mr Osborne: construct the environment where we can radically rethink public services. I hear so many of my senior colleagues say “if we had a blank piece of paper we would not organise a system like this”. But we are not able to start with a blank sheet of paper and maybe that’s the leadership problem. In this context a small but relevant example taken from my work in Special Educational Needs Transport is when council staff would ask parents “how can we help get your child to school?” The council immediately takes on the responsibility for getting the child to school (and the opportunity to reduce taxi costs or optimise bus routes is off the table). Instead, when we ask “how are you going to get your child to school?” we could have a very different conversation around a solution that is often more cost effective – but more importantly – delivers independence for better outcomes for many young people. Form follows function. This principle allows us to reframe the questions we are trying to answer. Simple solutions are often the best solutions. If we start with the blank sheet of paper we have a much better chance of reimagining public services than if we constrain ourselves with the existing organisational and governance boundaries.